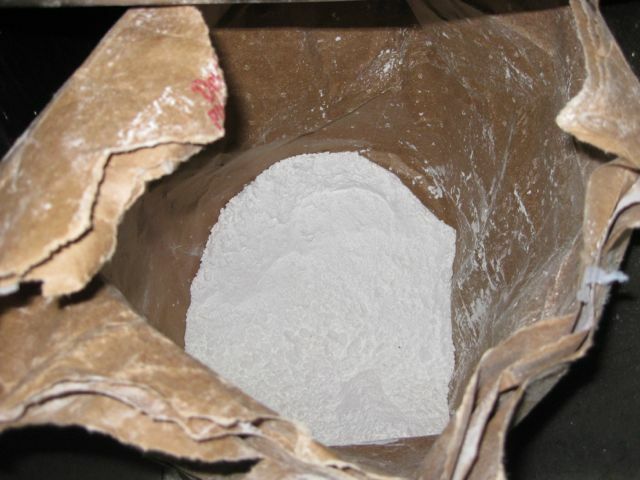 What is in your bag of flour (part one)…. What is flour? Flour is ground up grain, right? You may be shocked to learn that this is not necessarily fully so. On a recent trip to Canada I took the time to read the ingredients on the back of a flour bag. It is a national brand, an institution, in fact, called Robin Hood. It is up there with Allinsons, Home Pride, and Hovis. What I found was not a tempting sight. 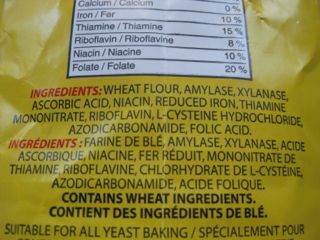 Whilst I am, naturally thrilled to find that it contains Wheat Ingredients (it is wheat flour, afterall) it was with mixed feelings that I read about all the other ingredients in the bag. My first question is this: what are these things and what are they doing there? My second question is this: are these things in bags of industrially milled flour in the UK and if so, why are they not listed on the labels in the UK? Read the label of a bag of Hovis, Allinsons, or Home Pride and you will see only this: flour. In earlier posts we have sung the praises of stone ground flour and we have always tried not to criticise anyone on this site. Not industrial millers, not plant bakers, nobody. Praise is the word. Lead by positive example. Show something good and people will adopt it....I still agree with my own philosophy, but I do think this label gives us a free and fair opportunity to explore industrial flour and allow everyone come to his or her own conclusions as regards purchasing it. Given the list of ingredients is so long, however, this is only part one. "Amylase is an enzyme that hydrolyses (breaks down) starches into simple sugars, and is widely used in bread making to break down complex starches found in flour. Amylase occurs naturally in yeast and when added to flour breaks down the starch to give a sweet taste, and causes the bread to rise as a result of CO2 production. Commercially amylase is used a bread improver/flour treatment agent and raising agent." It is also known as E1100. It enables weak (low gluten) flour to rise higher and faster than it would do ordinarily. "Enzymes such as proteases, xylanases and lipases directly or indirectly improve the strength of the gluten network and so improve the quality the bread." I think it all depends how you define quality. It certainly enables weaker (low gluten) flour to rise faster and higher when it is added. 3. What is ascorbic acid? Yes, yes, it is vitamin C but it is also a preservative - to give the flour a longer shelf life. Yes, yes, it is vitamin B3 but it is also a colour retention agent - to preserve the whiteness of the flour. 5. What is Reduced Iron? Phew. Not even half way through the list but certainly more than enough information for one post. More to come on the subject of this bag of flour and a call to action: contact your flour mill and find out. What is in your bag of flour? You might also be interested to know that Robin Hood Best For BREAD flour has also got AZODICARBONAMIDE which breaks down into two carcinogens. It is banned in Europe. It was recently revealed that Subway had it in its dough and the outrage in public media prompted them to announce that they would be removing it from their doughs.